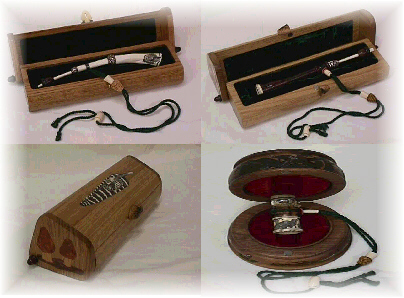 All of the calls can be decorated to suit the customer's tastes. Some of the more common things I do involve use of scrimshaw on different parts of the call. Mouth stops on the yelpers are plain rubber unless the customer wants the acorn mouth stop option. The acorn stop consists of a cap and nut turned on the lathe with a rubber block inside so that the stop can be adjusted. A finger groove can be put on the turned barrel yelpers at no extra cost. Ferrules and transition pieces on the suction calls can be made of pure silver, polymer ivory, fossilized ivory, or in rare cases gold. Custom lanyards & display boxes can also be ordered. All bones used in 2 & 3 bone calls are wild turkey bones gotten from legally killed turkeys. I will not make calls from domestic turkeys at any time.